One of my favorite creations of late has been my Greek Philosopher mask. For the next three posts, I’m going to go over the construction process I used for it. The inspiration for the design of the Greek Philosopher mask came from three sources. The first source, and perhaps the most subtly influential one, is The Frogs by Aristophanes. From the wikipedia article, the plot centers around “the god Dionysus, who, despairing of the state of Athens’ tragedians, travels to Hades (the underworld) to bring the playwright Euripides back from the dead. (Euripides had died the year before, in 406 BC.) He brings along his slave Xanthias, who is smarter and braver than Dionysus.” The play is a comedy of language, as many of the period were, and pulls weighty issues to light with a certain levity. I had the opportunity to play a portion of this back in the day with my dramatic other half. As such, I have fond memories of playing Dionysus against my matched foil. This inspiration is something which, I suspect, hid beneath my conscious thought as I came across my other sources. 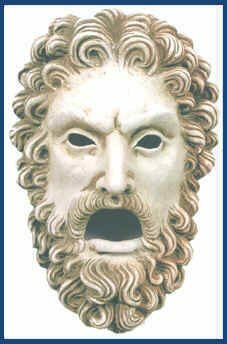 The final bit of inspiration for the Greek Philosopher mask was taken from an reproduction Greek “philosopher” mask. I originally went on a Google spree looking for the right work to inspire mine. There are some lovely collections out there of originals, such as the British Museum. You can view the pieces online, such as the ones pulled out by the linked advanced search. I ended up being attracted to a modern reproduction from a (now defunct) website. It can still be accessed via The Wayback Machine. The mask in question was entitled “Philosopher”, whence mine inherited the name. The first layer of the Greek Philosopher mask was produced in a bowl. The interior was contoured in such a way that it would roughly match my facial features. This method differs from the mask creation detailed in the Witch project. In the Witch mask, the back side was built upon from a flat surface, with less regard to a good fit against the face. For the Greek Philosopher mask, I wanted something which would fit well for long periods with heavy movement, similar to the expectations of a good theater mask. After a bit more material was added to the face, a head covering was added. Simple eye slits were cut which would later be broadened with further building. 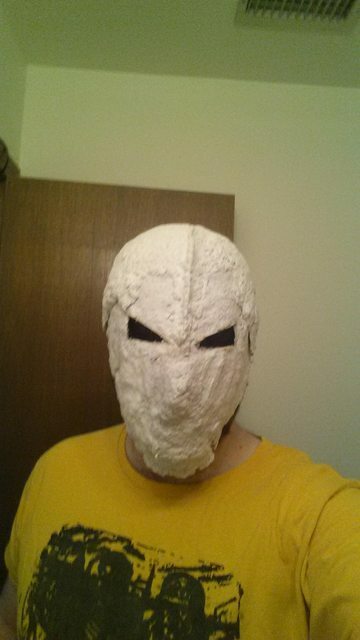 Next week, I will cover the construction a bit more, and the mask will begin to resemble it’s final form.